The artifice of fishing is displayed not only in the delusion of the fish, but to some extent in the delusion of the fisher also. Let him have the power of persuading himself that the boy in him has never grown up, or better, let it be so without his knowing it, and the world is his oyster. This quote was also chosen by ‘BB’ to open his book Be Quiet and Go A Angling. Hugh Tempest Sheringham was born in Tewkesbury. As a boy, he won a scholarship to Westminster and then he took a classical tripos at Cambridge. In 1903, he met William Senior ('Red Spinner'), the Editor of The Field, while fishing on the Lambourn and was offered the job of Angling Editor at the magazine. 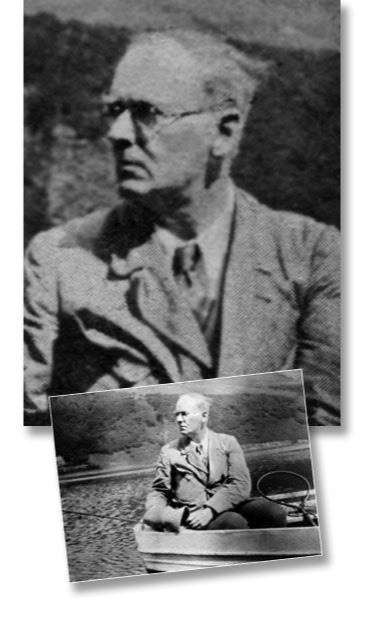 As well as articles, Sheringham wrote several books including: An Angler's Hours (one of Charles Rangeley-Wilson's top ten angling books), An Open Creel, Elements of Angling, Coarse Fishing, Trout Fishing: memories and morals and Fishing: its Cause, Treatment and Cure. It is his gentle, sometimes eccentric humour and love of the simple pleasures of life, together with a unique writing ability, that make his books still relevant and hugely enjoyable today. Sheringham spent much time in the Kennet valley in search of its trout, coarse fish, and in particular roach. He writes favourably about the pleasures of fishing for rudd, roach, chub and dace, and this was highly unusual for his time: in much of his writing he rates coarse fishing as highly as trout and salmon fishing. The Book of the Fly Rod was the last book written by Sheringham. He wrote it jointly with John C. Moore. and it was illustrated by his brother George Sheringham. It was the only book that he wrote in collaboration with his brother George, but unfortunately, Sheringham died before the book was completed. He died in May, 1930, at the age of fifty-four.